Objective: Students will determine life events from implied information. Procedure: Several printed (fake) checks will be at this station. 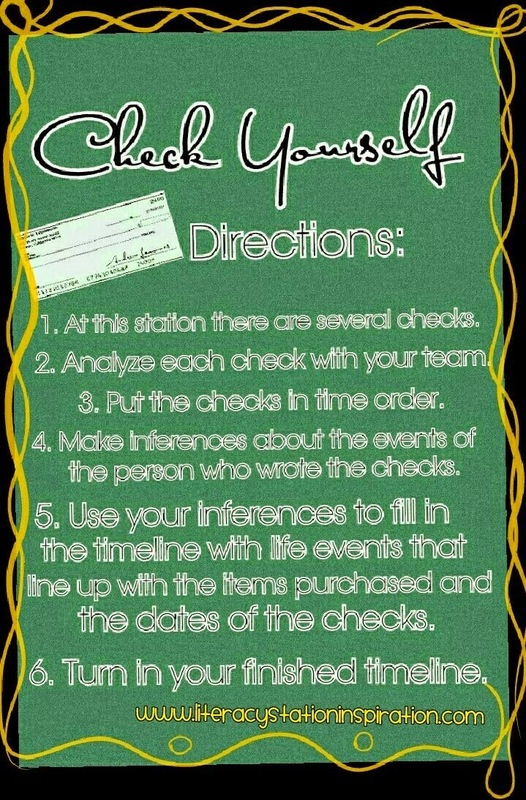 Students must put the checks in time order, then determine what life events took place for the check-writer to make the purchases. You may want to include a time line that is specific to this station. Objective: Students will understand how to interpret idioms by viewing them as literal images. Procedure: At this station there will be two handouts, scissors and glue sticks. One of the handouts is the printed images of the idioms. They will cut these out and paste them on the coordinating spaces of the other handout. 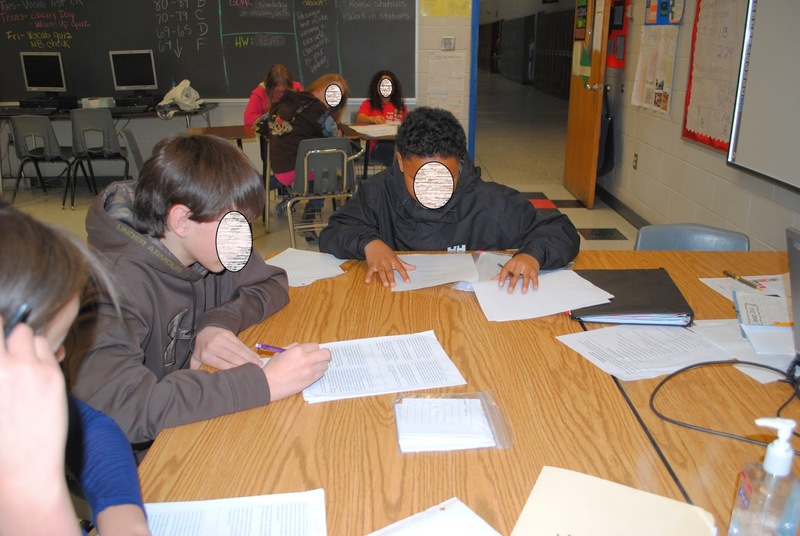 Objective: Students will read the same text from two different points of view. Procedure: This station will have one text and two colors of highlighters. Students will be instructed to read the text first from one point of view, and then from another viewpoint. They will highlight the words in each of the different colors that demonstrate mood from each different viewpoint. the "Point of View" station. 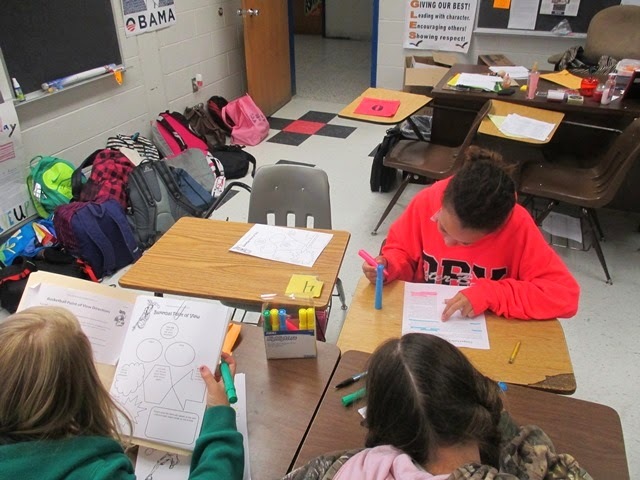 Objective: Students will work cooperatively to read short passages and determine their organizational patterns. Each graphic organizer will be drawn on the white board or chalk board. Students will read the short passages, then write the information into the appropriate graphic organizer after determining the correct text structure. Objective: Students will read a short story and and determine how their character's actions and quotes determine their traits. This activity takes character analysis a step further by having students determine how the character changes based on those traits. 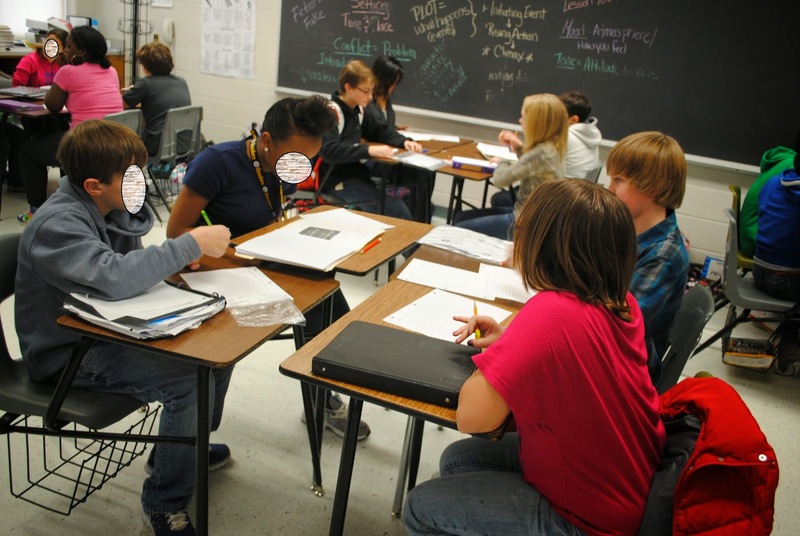 Objective: At this station, students work together to distinguish fact from opinion in order to rewrite an article. They must read an article, write down the facts, give their opinions, identify appropriate headlines, then rewrite the article from an objective viewpoint. Objective: Students will put a mixed-up story into order by making inferences and determining cause and effect relationships. Objective: Students will determine character traits and match evidence for each trait. Procedure: Simulate TEI-style questions at this station by giving students short biographies (we often use celebrities or authors with whom students are familiar or interested). The students will put their answers on a T-Chart that, in one column, lists character traits. They will be instructed to write in evidence from the short biographies that support each trait. To differentiate for lower-level students, the T-Chart can already have the evidence written in one column, and there can be strips of paper at the station with character traits written on them; students can glue the appropriate trait next to the evidence. 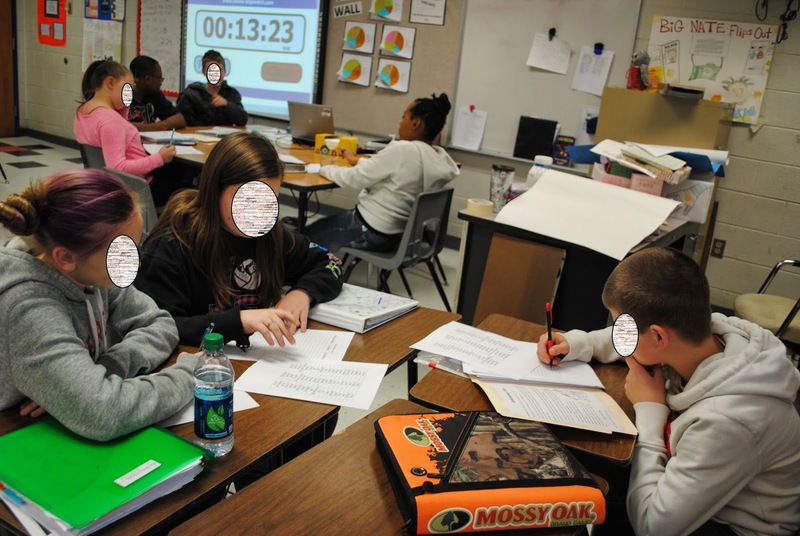 Objective: At this station students read a short passage and work together to compose questions. They must create closed questions, open-ended questions, and leading questions. Objective: Students will identify meanings of idioms using contextual clues. Procedure: This station has a single handout. The students work together to match the idiom or colloquialism to its meaning by making inferences and drawing conclusions. 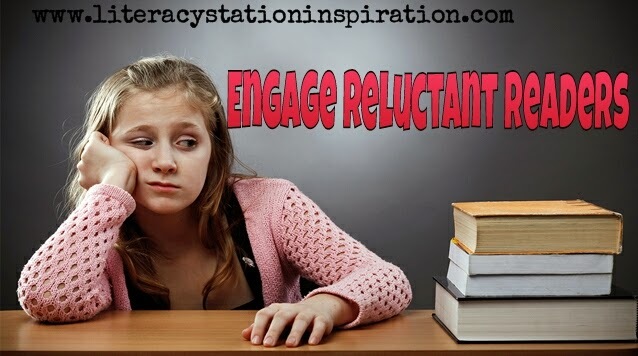 Objective: Students will identify moods associated with words and phrases. Procedure: What about for connotation we give them a short children's story, poem, or song lyrics that has a clear mood and they state what mood they want to change it to. Then they will replace the words in the story with other words that are synonyms in order to change the mood of the story. We would need a thesaurus at this station. Objective: Students make inferences and draw conclusions to determine causes and effects. Procedure: This station can contain sentences or pictures (or a combination of both) that represent causes and effects. Students must choose the appropriate matches and put them in the correct sequence. Finally, students work together to summarize the events in each completed scenario turn in their summaries. Objective: Students analyze authentic text to determine summaries, theme, and idiom. Procedure: At this station there are four very short fictional stories, six strips of paper with themes written on them, and six strips with idioms. Students must work together to read the short stories, choose the appropriate them, and match the idiom that shares meaning with that theme. Each of the selected matching components will be glued to a sheet of 11 1/2x17 paper and turned in to the provided envelope. You can also modify this station (per the handout) where they are simply choosing from multiple options and matching the summary and theme/idiom. Objective: Students will analyze nonfiction texts. Procedure: This station will have four envelopes, each containing information about a celebrity death/missing conspiracy. We chose to use Kurt Cobain, Marilyn Monroe, JFK, Bruce Lee, Tupac Shakur, and John Lennon (from UnsolvedCelebrity Mysteries by David Southwell and Sean Twist (2008). Students will be instructed to read each of the informational texts (shared reading) and fill out the accompanying charts. Conspiracy Theory Celebrity Reading The original text used was in print form; this is the link to a sample of the text. Objective: Students will determine mood and tone by making inferences about word choice. Procedure: At this station, there will be three or four short poems. On the poems, several words and phrases will be highlighted. Students will work together as a team to cooperatively determine which words convey the author's tone. They will write down the agreed upon words and phrases on the handout, then use their choices to write in the tone. This is a great way to simulate the TEI multiple-selection SOL test questions. Objective: Students will actively read and annotate poetry to improve comprehension. Procedure: At this station, students will need internet and computer access. Teacher will first model text-coding and annotating with mentor texts. After guided practice, students will work collaboratively online to text code and summarize. Skill Focus: Differentiating between topic, main idea, supporting details, and summary. Objective: Students will actively read and use a specific strategy to identify "trash", supporting details, and a text's main idea. Procedure: At this station, students each have a copy of the main idea handout. They will use highlighters to identify trash, supporting details, and determine the main idea of each paragraph. The station can use any selection of short texts with answer choices; the printables we used can be purchased here. Will you make handouts for the Conspiracy Theory Station available? I uploaded the handout today. Since we originally used a (print) book for the reading, we are in the process of creating handouts for each celebrity so they can be printed and glued onto a trifold or poster board. Thanks for visiting, and we appreciate the feedback! The stations look fantastic! Where did you upload the conspiracy theory handouts. We uploaded the handout for Conspiracy Theory station in the Stations: Reading section. We are working on the celebrity information. That is not available yet. We originally used Unsolved Celebrity Mysteries by David Southwell and Sean Twist (2008). We hope to have that up for you this weekend! I'm just finding this site now and it's amazing. 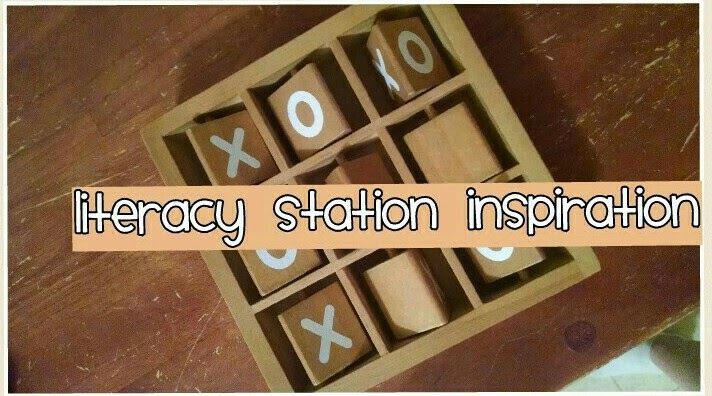 I'm really interested in the conspiracy station, but I'm noticing that the directions link isn't there. I'm also wondering...are you suggesting that a teacher needs to buy this original text to be able to provide the information to students to complete the activity (just to be sure I understand)? Thanks! Thank you so much for all of these! I teach 7th and 8th grade reading. I created and developed the curriculum last year, and am trying to create and develop the small group station model within my room now. This is all new to me so I greatly appreciate you sharing all of these and would LOVE to see more that you have created to help me get going with mine! Thank you for sharing all of these amazing centers!! They are engaging & common core aligned! Thank you! Is there somewhere I can find the handouts and directions for the Conspiracy Theory station? This is an awesome resource. Thank you for sharing!!! 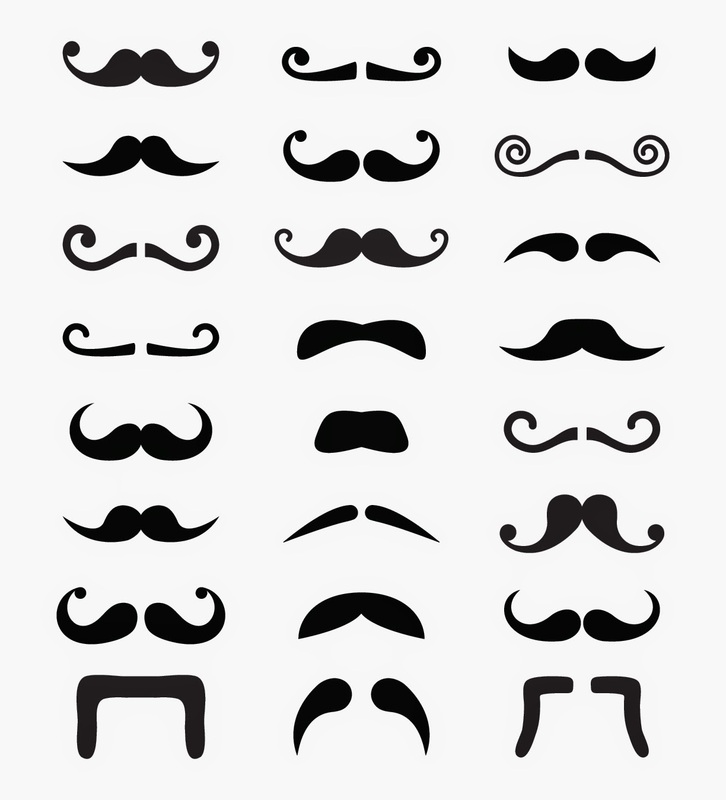 Check out this article about how to write character analysis. You will not regret it.